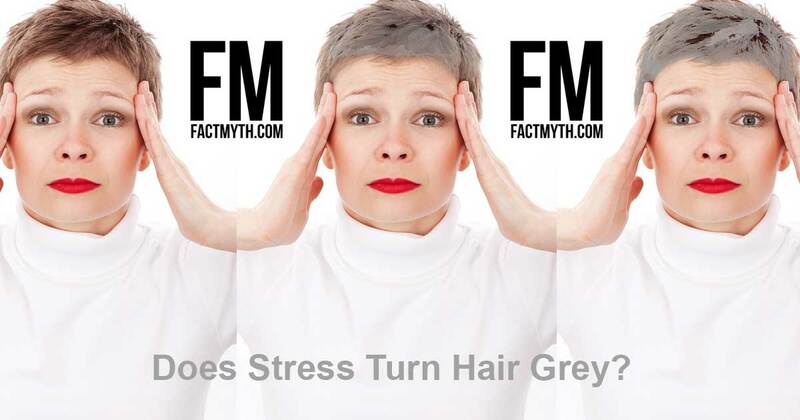 Stress Causes Hair to Turn Gray - Fact or Myth? Stress can turn hair grey. Does Stress Cause Hair to Turn Gray? Greying is largely determined by genes. Stress may cause hair to turn grey early, perhaps from increased oxidation, but studies are lacking. Stress has been shown to cause hair loss and other problems, but a direct link between greying (especially in the short term) and stress is yet to be found. Why Don’t We Know if Stress Turns Hair Grey? Why does our hair turn grey? – A Week in Science. This video gives a solid overview of how hair pigmentation works. TIP: Does stress make you age quicker or go grey quicker? Very likely, just look at any president. Can it make you go grey overnight, likely not, although many people report yes. Does Stress Cause Hair to Turn Gray Overnight? 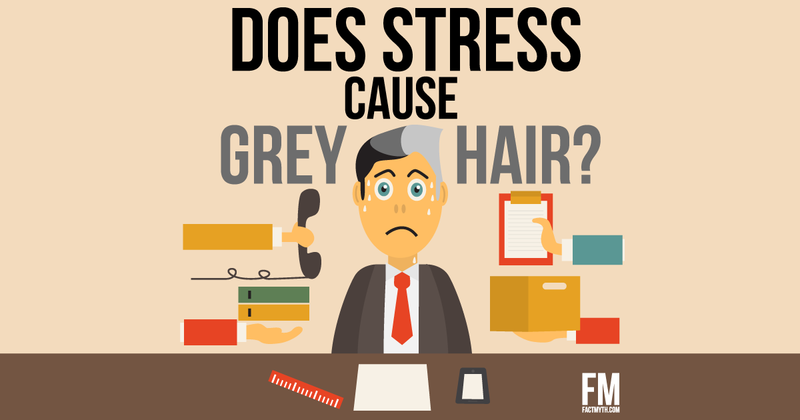 Stress can’t cause hair to turn grey overnight because hair is pigmented in the follicle, and it takes three to nine months for that hair to go from follicle to the hair on top of your head. Prolonged stress may cause hair to gray quickly, but we would need to go back three to nine months to link an event to a current hair color (part of what makes studying this tricky). What Can Cause Hair to Change Colors? Outside of going to the salon or hair being bleached by the sun, natural pigmentation (related to processes like aging) is the only known cause of hair coloring. Do Free Radicals Cause Hair to Grey? Although it may be theoretically possible for stress to unleash swarms of free radicals in the follicle that bleach the hair shaft, no cause/effect relationship has been established. Hair color is made in the follicle by long-lived epidermal cells called keratinocytes and colored by relatively short-lived melanocytes. The hair on your head does not turn gray naturally unless the melanocyte cells, which produce the color pigments eumelanin (dark brown or black) and pheomelanin (yellow or red), are depleted by your genetic makeup. When their melanin stops going to your keratinocytes, the pigment that goes into coloring your hair is reduced, and either gray or white hair grows instead of colored hair. What Causes Hair to Turn Gray? If you have ever colored your hair, you know that you can use chemicals to remove melanin from hair. Both bleach and ionizing radiation can change hair color quickly. Sudden hair loss can be caused by certain drugs such as those used in chemotherapy and some medical conditions. It is possible that, if lots of hair is lost for some reason, the remaining hair will be non-pigmented or lightly pigmented. Gray hair is less likely to fall out than dark hair, so sudden hair loss could conceivably result in the loss of pigmented hair, leaving only gray hair remaining. Hair loss can be an early warning sign of about 30 diseases, or can be idiopathic (occurring for no discernible reason). Some conditions, such as the autoimmune disease, diffuse alopecia areata, are known to cause sudden hair loss. The disease Vitiligo occurs when the cells that are producing melanin die and leave unpigmented or lightly pigmented patches of skin or hair. Is Obama Stressed Out? Why We Go Gray. What Does Stress Do To Hair? There is a fair amount of anecdotal evidence that people under extreme stress go gray or white quickly. There is an interesting Youtube video about Is Obama Stressed Out? Why We Go Gray, shown above. We hear stories about presidents such as President Barak Obama going gray quickly and people about to be executed such as Marie Antoinette and Sir Thomas Moore having their hair turn white overnight. It is possible that stress leads to sudden hair loss or leads to autoimmune disorders, which then result in the sudden loss of pigmented hair. However, no scientific proof of this phenomena has yet to be found. It is very likely that stress can turn hair grey, there are a number of obvious links, that said there has never been a definitive link. Instead greying is mostly a matter of genetics, stress may cause hair loss, or hasten the greying of someone with a genetic predisposition to it, but the science is still out on this one. Check out this Huffington post article that attempts to give a more definitive answer to hair graying for further reading.